blog.catalystlogic.com.au | James Keppel. Sydney, Australia. What better way to try out VS2017 RC, by creating a .Net Core solution on windows, and building it on linux. However the standard .Net core installation guide for Linux, as of the date of this post, will not build VS2017 RC projects, due to it utilising *.csproj files, and no longer creating xproj / project.json files. /home/user/DotNetCoreASP(1,0): error DOTNET1017: Project file does not exist '/home/user/DotNetCoreASP/project.json'. A version check will show that the "latest" is quite on the bleeding edge as it needs to be. Compare this to Powershell after a VS2017 .Net Core install in the windows box. Initially, the only option looked to be building from the preview branch in git. However, there is a series of preview binaries available for those looking to hit the ground running faster. Howover, that is waye tyopo easy. Let's build us the .Net CLI. After a git clone, switch to the preview 3 branch. The scripts go three to four deep ,at least. Adding a set -x to the top level script next to the existing set -e will give us some visibility into how the build is going. Once built set up a new symlink. As it will be to the same executable, dotnet, create it in a subfolder to /user/local/bin, and then remove it, and remove the folder. You can then have a stable binary, and a build version running side by side. One nasty looking error I bumped into was this one, in red, making it extra ominous. The build failed. Please fix the build errors and run again. Let see, its mention Net 4.0, and a GAC< on a LInux bo-x that is running .Net Core. Not looking good. There are no .Net 4.0 References in the project and the whole point of .Net Core is to stand alone with a dependency on Mono. As for the GAC reference, this message doesn't give is much to go on. Until you realise all you need to do is restore the project. It does show that while the base cross-platform functionality is there, removing the legacy windows reference is going to be some time away for this fledgeling framework. 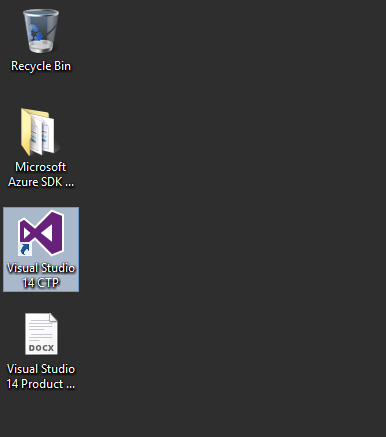 Posted in .Net, Linux, Visual Studio. Tags: .Net Core on November 20, 2016 by James Keppel. Using docker cloud can result in a black box experience should something go wrong. This is especially the case when you provision the node from the cloud UI. Building a stack with Docker/Dockercloud -AuthorisedKeys however, can get you SSH access, to poke around inside. This will let you add root access via your SSH cert. Once inside, you can take a peek at various logs using a couple of methods. Posted in Docker on November 13, 2016 by James Keppel. A recent vulnerability scan using McAfees Secure Scan, one of those automated scans often used for PCI-DSS self certification, advised that the Windows Server in question disclosed the internal I.P. address. We have run both McAfee's Secure Scan and Comodo's Hacker Guardian. McAfee charges for one I.P. at about USD$300, which is about the price Hacker Guardian asks for about 10. However, McAfee's report is much more thorough, and goes into much more detail into information disclosure vulnerabilities, where as hacker guardian sticks to the standard Mitre CVE issues. Some Web servers contain a vulnerability giving remote attackers the ability to attain your internal IP address or internal network name. An attacker connected to a host on your network using HTTPS (typically on port 443) could craft a specially formed GET request from the Web server resulting in a 3XX Object Moved error message containing the internal IP address or internal network name of the Web server. A target host using HTTP may also be vulnerable to this issue. McAfee gave a link to clear detail on how to resolve the issue, which I later found worked perfectly. though that was no fun, I wanted to see the vulnerability first hand. A 3xx Action in Invoked. curl https://www.website.com.au/ -v -l --http1.0 --Header "Host: "
However, after adding this the vulnerability did not reveal itself. The missing factor was outlined in this Juniper Vulnerability page. I first tried adding a folder to the curl request, however forms authentication resulted in every folder resulting in a redirect back to the forms login page. I then tried a publicly accessible folder, used to store files meant for public access. This gave me the internal IP address, as clear as day, in the location header. The final curl command that found it was in the following format. curl https://www.website.com.au/folder -v -l --http1.0 --Header "Host:"
As per the McAfee report. this MS blog page details how to resolve the issues in IIS 7+. Where "serverName" is what you wish to show in place of the I.P. address. As expected the following was added to the applicationHost.config file. Posted in IIS, Vulnerability Testing, Windows on May 10, 2015 by James Keppel. First AWS summit, and despite being held during the worst storm in Sydney in a number of years, they put on a good show. While obviously an opportunity for partners to peddle their wares, they kept this focused on the methodology and process behind determining what workloads should get moved to the cloud. Using business process mapping to break down legacy software, and breaking down the process to discovery, analyse, mapping, profiling, migrate & integrate, it gave an insight to what goes on behind the scenes of some of the larger cloud migration projects. I was concerned this would be a bit too business focused, and leave me wanting more technical details, however while it didn't drill down into the nut and bolts, I am glad I included it as part of my first summit. While it gave a good overview to all the services, something that would be wasted on a AWS veteran, the case study on Reckon is what gave me the most value in this session. Breaking down the journey from an on premise, to close to all in cloud company covered a huge range of smaller steps their IT department and company as a whole took. It was presented in a way where they focused on what each step achieved, and left it open to how, and the order in which the audience could follow the process. Including steps such and finding a technical champion, legal & compliance, when to think about moving from AWS business to AWS enterprise support, and the one that stuck with me, implementing a cloud first policy. Workload go in the cloud, unless there is a reason to keep them on premise. This satisfied my technical curiosity, and as someone who started a trial account, firing up a micro instance and then wondering what the hell i was supposed to do now, this session was great in covering going from a new account, to a somewhat hardened, user & group level secure account, while diving into VPC's, infrastructure examples, direct connect, billing & cost management, VM services, all the way though to touching on DevOps automation. This was the one I was looking forward to, and it did not disappoint. It was a solid segue from the previous session, where once you had dipped your feet into a range of services, it drilled down into their DevOps stack. 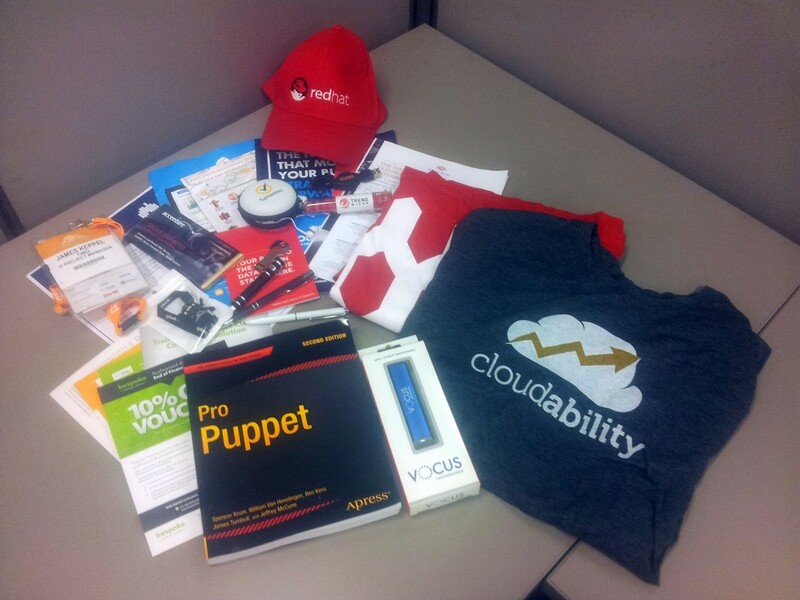 As an AWS newbie, the step by step through the whole Cloud Formation & Opsworks DevOps stack was great. Full of solid use cases, and followed up by real world examples, and lessons thanks to Mike Lorant from Fairfax. Big thanks to the Puppet booth team for the Pro Puppet book! Posted in AWS on April 29, 2015 by James Keppel. While chrome developer tools allow you to test for many http post vulnerabilities relating to invalid post data, testing for a slow post vulnerability needs Googles slowhttptest tool. My LMDE does not have this out of the box, though Synaptic delivered. 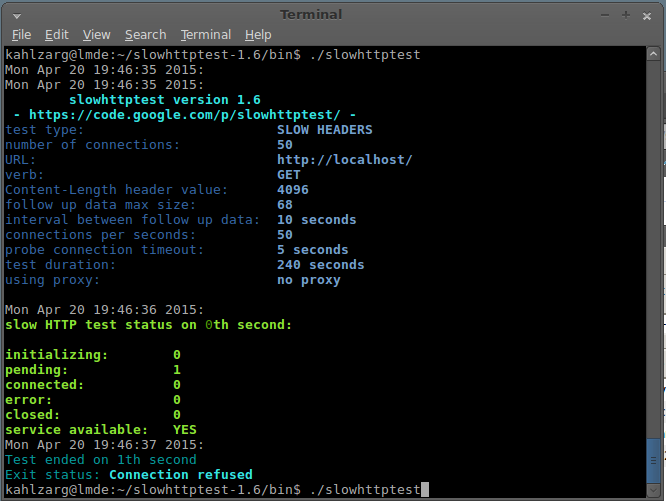 After the make, running slowhttptest hits up localhost by default. Nothing interesting without a local test server. Shekyan also includes the syntax to launch an example of the SLOWORIS attach to test on your own servers. Posted in Linux, Vulnerability Testing on April 20, 2015 by James Keppel. With the success on preliminary benchmark on my use case for Elasticsearch . I thought I would see how it ran on a ARM based ODroid U3. The U3 is a credit card sized mini PC from HardKernel, that runs Android or Linux. 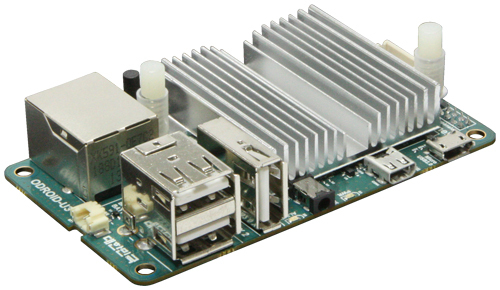 The Odroid U3 Specs include a 1.7GHz Exynos4412 Prime Cortex-A9 Quad-core processor, and 2GB RAM. While it support MMC storage, I'll be using a 16GB Sandisk Ultra UHS I Class 10 SD Card, in part to makes things interesting, and in part so I easily swap out my Android XBMC MMC between projects. I have gone with Ubuntu 14.4 from the ODroid forum site. Oracle Java 8 via apt-get was straight forward, however elasticsearch via packages.elasticsearch.org did not explicitly support armhf. However apt-get update gave me the following error. As Elasticsearch runs in Java, I figured running the x86 version would be fine. Just needed to figure out how to do it. After hitting a dead end after editing /etc/dpkg/dpkg.cfg.d/architectures, I tried adding architecture tags to /etc/apt/sources.list as outlined in the Multarch/HOWTO. Worked a treat, package sources updated, and elastic search installed as a deb package. Posted in Elasticsearch, Hardware, Linux on April 5, 2015 by James Keppel. Like any software raised on linux, even where it runs under a JVM like Elasticsearch, running it on windows bring to light a few quirks. One of the most common Elastic Search Environment Variables is ES_HEAP_SIZE, shown in the System variable panel below. With the default set to 1GB, setting this is often done early on, though note the following 2 gotcha's in windows. After you set the ES_HEAP_SIZE, you need to re-install the service. Restarting ES won't do it. If you are restarting the service from the command line, remember to open a new CMD window after setting the Environment Variables, A stale window will hold the old value, (or have none if none was set) and restarting the service in that cmd.exe session won't update the heap size. Also, remember to not cross 31Gb! Posted in Elasticsearch, Windows on April 4, 2015 by James Keppel. Azure Web Sites support IP restriction in the web config, as demonstrated by Stefan Schackow's MSDN Blog. Commenting out the entire location tag resolves the issue. Posted in .Net, Azure on September 7, 2014 by James Keppel. 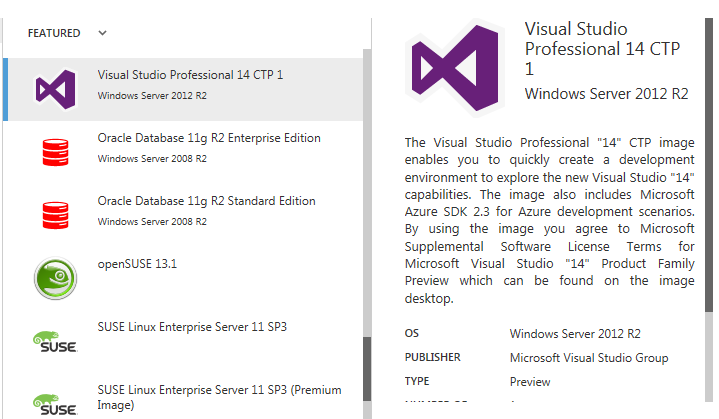 Microsoft Azure has successfully lured me in with their promises of a VS2014 CTP VM. Recently completed MVC training was my first introduction to Azure, so outside a learning environment the VS CTP was a chance to dust off the account. Having that on the first page that opens when I click on billing, is transparency that will go along way with those who are less trusting of cloud computing. All very straight forward, select add, and select VM for Gallery for existing images. Minimum required info to get me started... not bad. 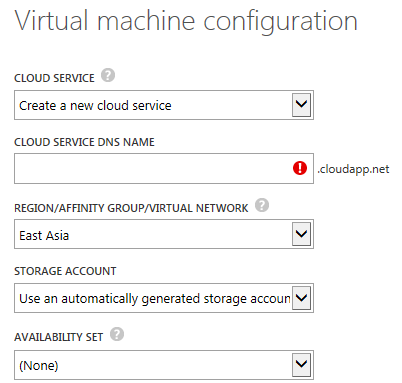 Now if this is your first VM, note the Cloud Service DNS name will be reused for all VM's. Under endpoints check the RDP public port. This will access your machine via NAT. RDP into <CloudServiceDMSName>.cloudapp.net : 59276 (in is case), and you're in. 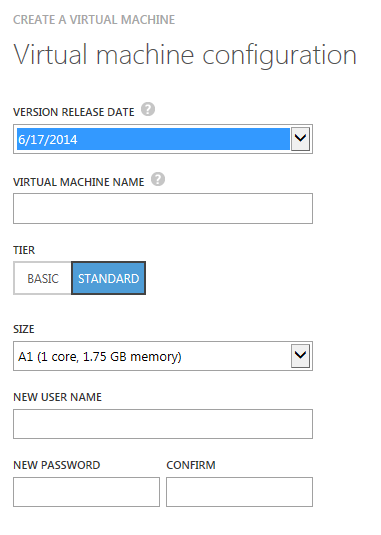 Posted in .Net, Azure, Visual Studio on July 1, 2014 by James Keppel. After a long wait, and a missing, though refunded shipment from one vendor, I finally received 4 MCX to Co-Ax Converters from ebay. 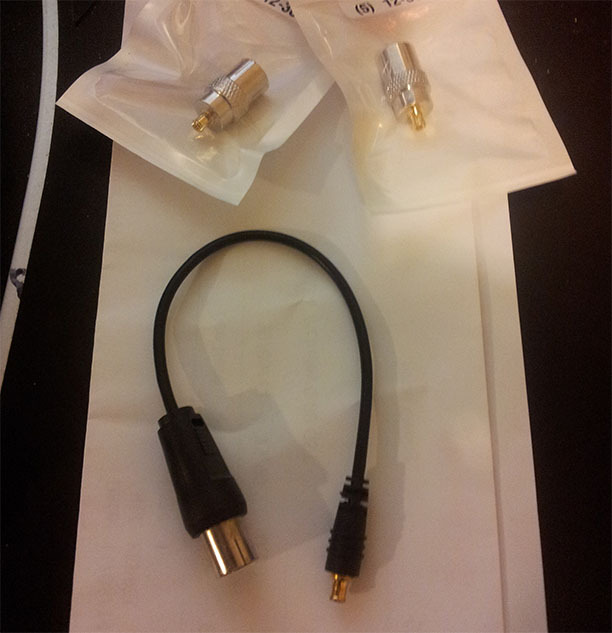 Not willing to wait after the first AWOL shipment, I ordered 2 flyleads and 2 one piece converters. The difference in FM radio off the bat was huge. 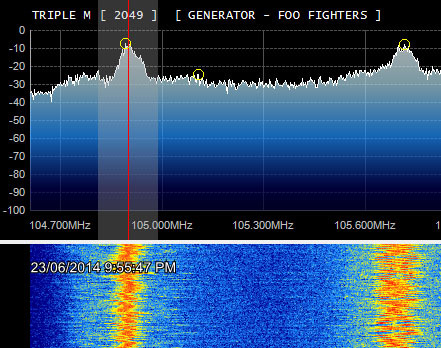 With a slight adjustment of the AF gain and setting Noise reduction to -75db, the signal was crystal clear. SDR# also picked up the 64 Character Radio Data System message, though that come through at a character or two every second. Next I'll be seeing what luck i have getting anything of substance from Bankstown Airport traffic control. Posted in Hardware on June 23, 2014 by James Keppel.